Saturday night, Yale did something the previous 20 visitors to Lavietes Pavilion couldn’t: Beat Harvard on its home floor. The Bulldogs’ army of long, physical defenders frustrated Harvard’s offense all game by switching screens and contesting most shots, but more interesting was how Yale, despite 19 turnovers, scored 74 points on 67 possessions against a stout Harvard defense. The Bulldogs took 29 trips to the free-throw line and grabbed nine of 22 possible offensive rebounds, but they almost always do those two things well. What came as a surprise was their shooting: 51.2 percent from the floor and 6-for-10 on threes. Saturday marked Yale’s fifth-best effective field goal percentage of the season against a Division-I foe, and three of those other four came against bad defenses (the exception being Providence). 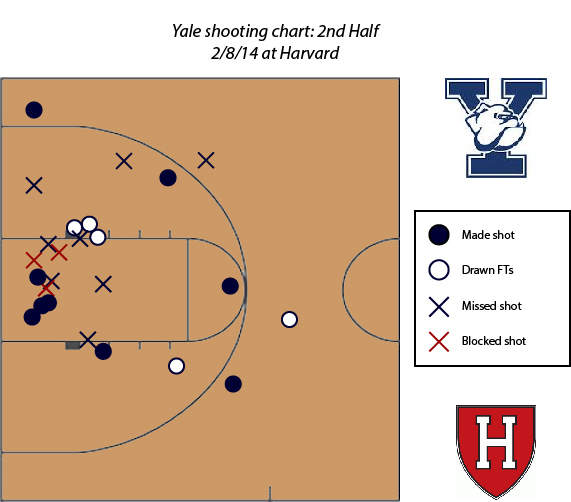 Harvard had not allowed any team to shoot as high of a percentage as Yale did Saturday. So how did the Bulldogs do it? Unsurprisingly, the Bulldogs tried to attack the rim — and in the first half, they did so very effectively. 13 of the Bulldogs’ 24 shots came in the paint; though three were blocked, nine of the others found net, and Yale drew fouls on two additional shot attempts. 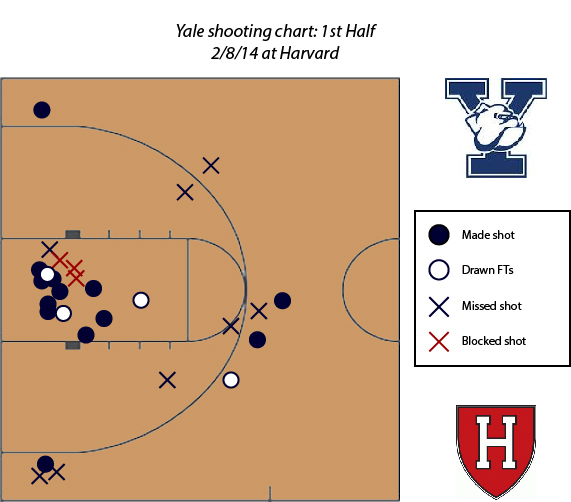 Yale’s track record from the perimeter was more mixed — it doesn’t really have any ace shooters and makes just 32 percent from distance as a team — but nearly every deep shot was wide open off of an offensive rebound or against a zone defense, allowing the Bulldogs to make four threes. Yale attempted only three treys in the second period, again trying to take shots inside — but it was much less successful after halftime. Thanks in part to another three blocks, the Bulldogs shot just 4-for-12 inside the paint, as Harvard was generally better-positioned in defense and forced more contested shots. But Yale overcame that in part by doing what it does best — drawing fouls with physical drives, earning free throws and making the most of them (83% for the game). 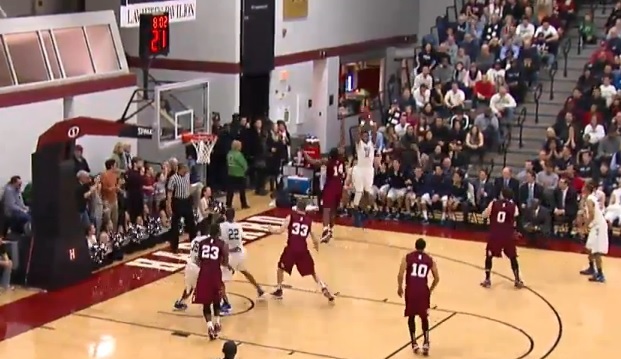 “They made every big play they needed to make when [the game] was kind of teetering,” Harvard coach Tommy Amaker said. The only flaw of Yale’s offensive performance on Saturday was its turnovers — 19 in all, a 28% turnover rate. But even in this regard, it wasn’t as bad as the top-line numbers look. For the game, Harvard only had five steals; the remaining miscues were dead-ball turnovers, including a crazy number of travels called for Bulldogs moving their pivot foot before starting drives. That isn’t exactly a good thing — aesthetically, it might be even more frustrating than steals forced by a good team — but it meant Yale could set up a defense instead of allowing transition baskets off of live-ball giveaways. And when Yale held onto the ball, Sears (21 points, 10 rebounds), Cotton (13 and 10) and Duren (15) gave Harvard’s defense a physical challenge it won’t see anywhere else in the Ivy League. After two close losses last year, the Bulldogs finally snapped a four-game losing streak on the Crimson, capping off a terrific weekend that left them tied for first place. This entry was posted in Harvard, The Breakdown and tagged Armani Cotton, Harvard basketball, Harvard Crimson, Harvard-Yale, Ivy League, Ivy League basketball, Javier Duren, Jutin Sears, shot charts, The Breakdown, Yale basketball, Yale Bulldogs. Bookmark the permalink.